Covered unheated outdoor vivaria - greenhouses and similar. So far as orientation and drainage are concerned these factors are identical to those for open outdoor vivaria. Escape proofing might seem easy on the face of it, but greenhouses do give rise to their own problems. Although these vivaria are fully enclosed, "off the shelf" varieties don't really take into account the need to prevent anything other than plants getting in or out! Apart from anything else you may well find that doors, lids (in cold-frames) or even glazing do not fit snugly enough to prevent escape by small and agile lizards and amphibians. The first step here is to ensure that it is carefully erected. Even then it might prove necessary to replace some ill-fitting glass (although you would be well advised to replace most of it - more about this later), or to seal gaps where it joins the framing with silicone sealant and to fit additional sealing strips to doors and lids. A further problem can arise with ventilation. The interior of a greenhouse can get very hot. Indeed, too hot for many species which would otherwise find it ideal. So, it can often be necessary to have a door and a roof vent open but these, of course, can provide a wide open escape route. In my case, where I have used garden frames all or part of the lid has its glass replaced by strong wire mesh. Greenhouse vents are used unmodified only where the animals cannot possible reach them. Generally, the vent is completely omitted, and fine mesh fitted over the resultant hole. If necessary, in the winter months, a sheet of glass can be clipped over this. In the case of doors, I usually firstly fit a barrier across the bottom of the doorway to prevent extremely easy access, and make up an aluminium framed wire meshed door opening over this. Predator proofing is largely addressed by the above steps. One additional problem arises though and that is the risk of breakages from, for example, the neighbour's son's football! In my case I have adopted what might be perceived as an extreme solution by including the greenhouses themselves within the wire mesh "fruit cage" assembly. Years of experience have taught me to place young children in the same group as predators! Decor and landscaping. This follows much the same rules as for outdoor vivaria. It is, however, of paramount importance to ensure the use of caves and/or dense vegetation to provide cool shady areas. Even the hibernaculum is still necessary and also provides a refuge in extremely hot conditions. The provision of a pond is essential for amphibians and a greenhouse can become very humid which can be advantageous or disadvantageous according to the species. This can be reduced by ventilation which is almost invariably essential. Glazing. If you obtain a new or second-hand cold-frame or green house it will usually come with some form of glazing. This is quite variable and while the most common material is 2mm horticultural glass, thin acrylic sheet and horticultural twin wall polycarbonate also occur. While any of these are usually sufficient for the well-being of most herps, lizards in particular need good quantities of UVB in order to synthesize Vitamin D3, and this is certainly essential to successful breeding. Even some amphibians will happily bask in even the hottest sun and do better with access to UVB. Unfortunately NONE of these common glazing materials transmit UV rays to any appreciable extent - unless, fortuitously, the acrylic sheet is not of the UV shielded variety. UV transmitting 2 mm acrylic sheeting can be purchased (it will successfully allow well over 90% of the UV through) and in all of my greenhouses at least some of the glazed panels have been replaced with this. As a measure of its efficiency, my Painted Agamas rarely produced eggs in the two years they lived in the greenhouse with standard glazing and those eggs failed to hatch. After the change to acrylic sheet, I now get numerous clutches of eggs with a 90-100% hatch rate. An additional advantage is that it has about 20 times the impact resistance of ordinary glass (see comment re small boys and footballs above). Sadly converting a greenhouse to UV transmitting is a fairly expensive job but with the enormous increase in the welfare of the animals, improved breeding and additional security it is a worthwhile investment. 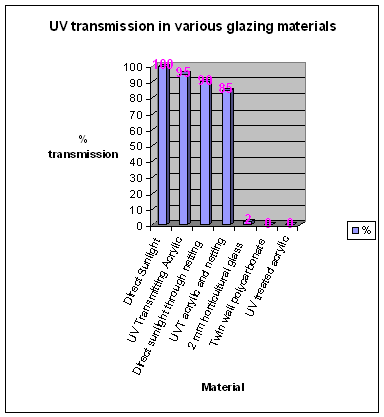 *UV transmitting acrylic can be difficult to source. Please see the "Links" section for details of a supplier I highly recommend. Modifying greenhouses. None of my greenhouses have been built as the manufacturer intended. Basically, I prefer to have their northern sides much better insulated than mere glass or plastic and replace it with a lightweight insulation block wall. This also assists in interior profiling to give southerly slopes and with the provision of shady areas and hibernacula. The lengths of framing released by this are used to extend the depth of the greenhouse and towards the glazing of vivaria. Hopefully the diagram aside illustrates this and uses the same symbols etc as the outdoor vivaria diagrams. 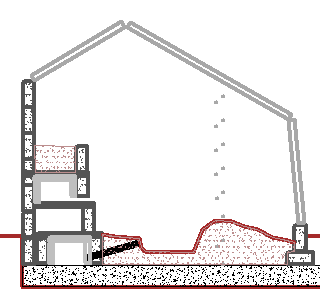 The dotted line shows where the front of the greenhouse would normally be and where an intermediate support of aluminium angle is fitted. Garden Frames. All of the above principles can also be applied to modifying garden frames to make small vivaria. Remember, though, that they will be even more prone to overheating and they will need very securely fitting lids raised well above the top of the vegetation. They benefit considerably from being erected on a concrete block base giving an additional 225 mms clearance.